99% Off 22 Professional Fonts. That’s a Saving of $2500! I don’t think I’ve ever seen anything for sale at 99% off before, but Design Cuts have just released a new font bundle with this massive discount. For a limited time you can get your hands on 22 professional font families worth $2622 for just $29, giving you an unbelievable saving of over $2500! The fonts included are top quality too, they’re all best sellers at their full price, which is often more than the entire bundle. Each one comes with multiple weights, extensive language support and loads of contextual alternates, which sets them apart from the bog standard free fonts you can find on the web. To round off this fantastic deal, you also get extended licensing and free web fonts so you can safely use these fonts in all your design projects. One of the stand out features of this collection is the mix of artistic fonts and corporate style fonts. Beautiful Hand drawn script fonts are loads of fun to play around with to create personal designs, however the more modern, clean, professional fonts are invaluable for client work. This bundle contains the best of both worlds and provides loads of new fonts for business and pleasure! I now have a bunch of new favourite fonts, here’s an overview of the ones I love the most. All I need now is an exciting project to use them in! The Darwin font is a great example of a professional font suitable for the most high profile design project. It’s expertly designed as a complete family comprising of every weight from Extra Light to Black, with italic and alt variants available for each. Loveton is a tall and thin script typeface that perfectly complements wedding card designs, handcrafted products, vintage products, etc. This is another font that’s packed full of ligatures and stylistic & contextual alternates to allow you to create unique typography designs every time. Booster Next FY is a fun round sans-serif with a friendly character. This font would be ideal for an infographic design with the choice of six weights, or you could make use of the web font included in the deal and create an extraordinary website design using this super clean typeface. Grota Sans is the kind of font you need in your arsenal for a desktop publishing project where you need to design a magazine or brochure layout. With 40 fonts in the family at your disposal you’re well equipped to create stunning headlines and complementary body copy. Frost is a typeface that really harnesses the power of alternates. With at least 3 variants of every single letter, this font will give you beautiful typography every time that will be difficult to tell apart from custom lettering. These alternates, ligatures and swashes really come into effect when you’re designing a logo, where every letter has to be perfect! This is just an insight into 5 of my new favourite fonts. It’s hard to believe that for $29 you also get another 17 top quality fonts with extended licensing included. Check out the full deal overview to see all the details. 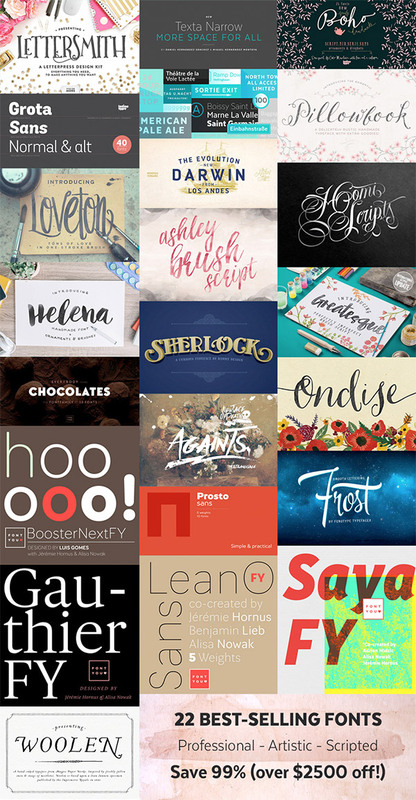 These fonts will last you your entire design career, but the offer isn’t around for long. I receive a lot of emails about the deals I share with my readers a fews days after they’ve expired, from people who left it too late and missed out. At 99% off this is an insane deal so I’d highly recommend you pick it up while you can! Love these, especially Booster Next FY. These are great, I like seeing them in use before I buy as well. $29 is not bad at all, great value. A fair deal for unique-looking fonts. ‘ Nuff said.